I made kara boondhi and was very happy as I got the right shape of boondhi without tails. So proceeded to try sweet boondhi. It is fun making boondhis as they look cute like pearls in the oil. 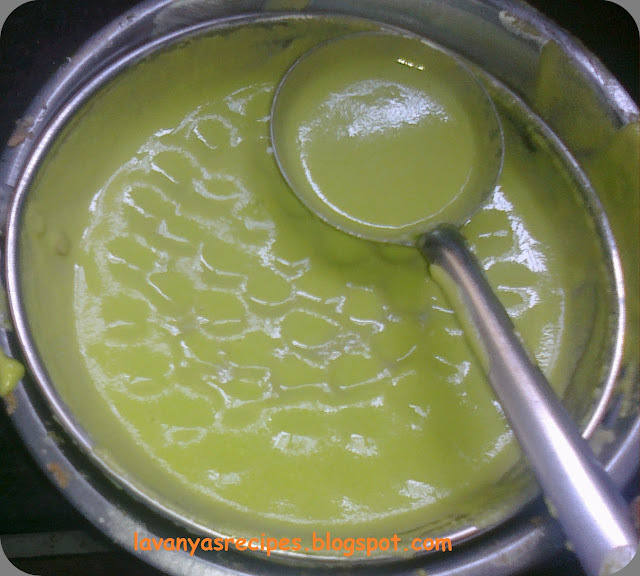 I have used orange red and green colours and had the plain batter and thus got three colours as in the previous post Colorful Kaju Katli. You need two slotted ladles for making this. One for dropping the boondhis and another one for collecting. We would need one ladle for spreading the batter and two vessels to make the colored batters. Take one vessel to make the sugar syrup. Add sugar in a pan and pour water just to immerse the sugar. Keep stirring until u get one string consistency. Then add crushed cardamom to the syrup. 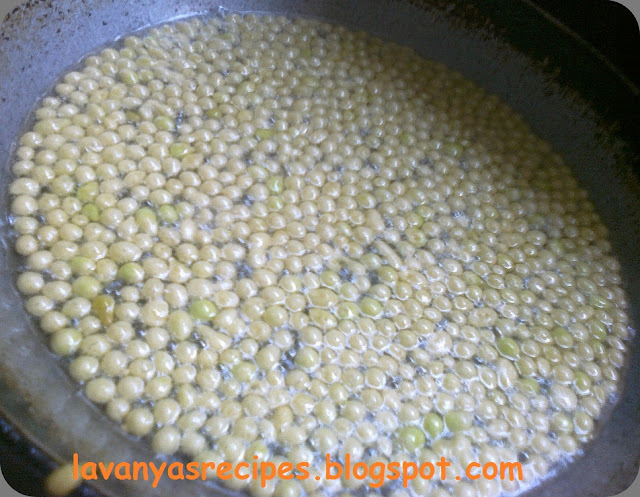 Sieve besan and rice flour two to three times. Add salt, cooking soda and mix well. 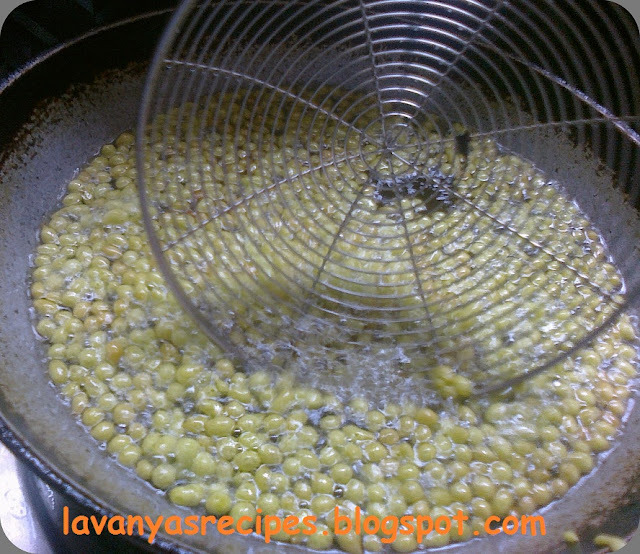 Add enough water to make the dough like dosa batter and add two spoons of oil to the batter to ensure free flow of the batter into the oil. 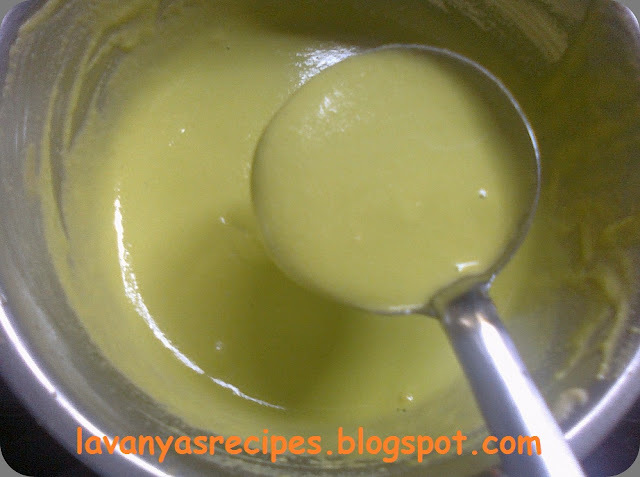 Divide the batter into three portions and add green colour to one portion. Now pour the batter into the boondhi ladle and spread with the help of another ladle. No need to make the boondhi crisp. Just ensure they are cooked properly by turning them in between. Don't they look cute??? Finish off the green batter, and then the red one and the plain one in the similar way. 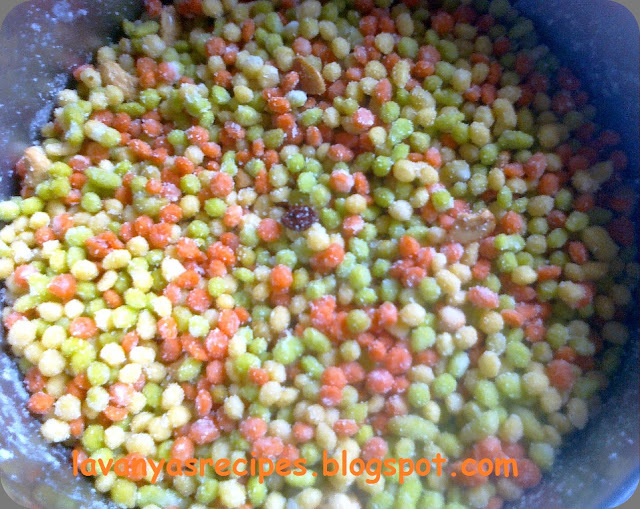 Warm up the sugar syrup and add the tricolored boondhis to the sugar syrup. Mix well and add the cloves, cashews and raisins. On cooling the sugar crystallizes and tastes awesome. Love these little pearls a lot! You have got the perfect shape too..